Your paddling adventure on Superior may include a wide range of weather. Nights can be quite cool and days warm, mostly it’s very sunny and occasionally it rains! Three sets of underwear and wool socks (leave the cotton socks at home). One for water. We recommend water shoes/aqua socks/neoprene booties or sandals that can get wet. Your feet WILL get wet. Be prepared! One dry pair for camp and walking around- no need for hiking boots. These must be a different pair than your wet shoes. Your camera! Don’t forget a waterproof case, extra memory card and batteries! Personal hygiene products such as deodorant, toothpaste, toothbrush, biodegradable soap, and a hairbrush. Look for environmentally friendly products at your local drugstore or health store. Your personal medication. Labelled clearly, in waterproof containers. Twice as much as you need, in two separate containers. Sleeping bag (small and stuff-able. NO large flannel bags please). We have ones available to rent. Layer one: synthetic long underwear. Layer three: rain gear, wind breaker or paddling jacket. AVOID COTTON CLOTHES for cold water paddling– it dries slowly and will not keep you warm when wet. Having cotton t-shirts in the mix though is fine if the weather is hot – cotton will help you keep cool if you get them wet. Food (we have lots), camp cooking equipment and eatery. We do have a small paddle shop on site that stocks a small supply of paddling gear, books, souvenirs etc. On this trip, we provide large waterproof canoe packs that will normally carry the tent and personal clothing of two people. Even though it seems like there is a lot of room in the canoe, please bring only what you think you will need. When on the water, depending on where they are in the boat, direct access to canoe packs may be difficult so we recommend you also carry a small day pack to hold water bottles, camera, a fleece, rain jacket, suntan lotion, snacks, etc. See top list and alter on-water clothes as this is not a water based trip. Remember that you have to carry all of your gear plus some group gear so items that can do double-duty are a good idea. Bring good, sturdy, well-worn hiking boots (with stiff sole and good ankle support) PLUS a pair of light runners or sandals for camp. Hiking stick (optional). We have ones for purchase in our paddle shop. Students must be dressed for spending the day outdoors in a variety of spring/fall weather conditions. Kids will be more comfortable if they dress in layers. If synthetic or wool clothing is available that’s wonderful because they both repel moisture, dry faster and will be more comfortable. But it’s not critical. Life Jackets are mandatory and must be worn for all on water programs. We supply life jackets and our boats are fully outfitted to Coast Guard requirements. If your child has a lifejacket and wants to bring it, great. Cameras are welcome but not electronic devices. In addition to regular clothing, an extra layer for warmth (sweater/jacket), a hat and a rain jacket as weather can change quickly. Hat and gloves are recommended for cool weather. As appropriate: Sunscreen, sun hat and bathing suit/towel. Water bottle. Any required medications. A bag to put it all in. 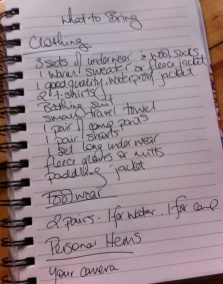 In addition to the list above, kids will need an appropriate sleeping bag, sleeping clothing and a clothing change. If they have one; a flashlight and small pillow (or substitute) are options as is a foamie/thermarest if they have one (otherwise we can provide). So much Southern hospitality. The friendly welcome, delicious dinner, comfortable accommodations and interesting company of you northern Ontarians are an unbeatable combination.